Glycolysis consists of two parts: The first part requires ATP is invested to provide energy to separate glucose into two 3 carbon sugars. separation. The second half of glycolysis produces ATP and electrons from hydrogen atoms and attaches them to NAD+, producing NADH. Two ATP molecules are invested in the energy investment phase and four ATP molecules are formed during the energy payoff phase. This produces a net gain of two ATP and two NADH molecules for the cell. Glycolysis the first step of cellular respiration. It describes a sequence of reactions that break down carbohydrates into smaller molecules. Broadly, glycolysis breaks down a glucose molecule and forms 2 pyruvate molecules, with the release of two molecules of ATP. Glycolysis evolved a long time ago, and is utilised by the vast majority of organisms. It literally means ‘splitting sugars’. Glycolysis takes place in the cytoplasm. It is a complex process, and has ten steps requiring various enzymes and co-factors. 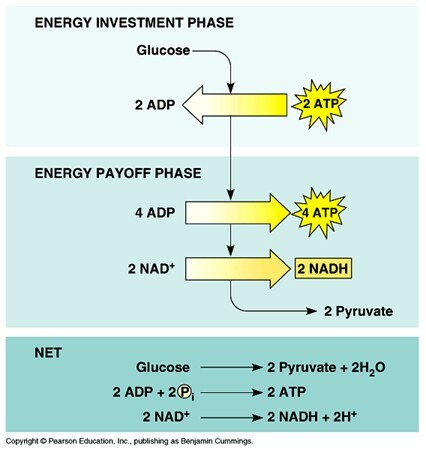 Glycolysis can be separated into two phases: the energy-investment phase and the energy-payoff phase. In the energy-payoff phase, the three-carbon sugars are converted into three-carbon pyruvates, through a series of enzyme-mediated reactions. During this process, two ATP molecules and one NADH molecule are made. However, because there are two pyruvate molecules to be converted, four ATP and two NADH are made. Glucose is first phosphorylated to glucose-6-phosphate with an enzyme called hexokinase. This requires the investment of a molecule of ATP. 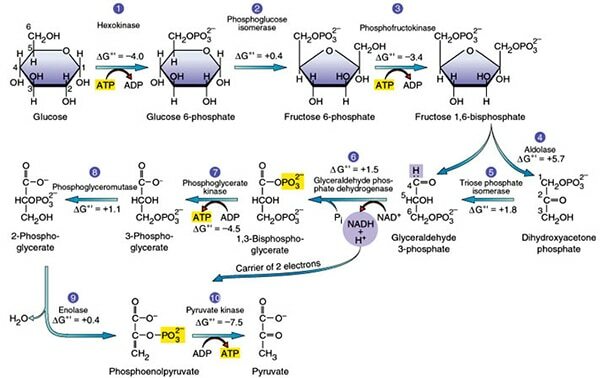 Glucose-6-phosphate is then converted to fructose-6-phosphate by an enzyme called phosphoglucose isomerase. Next, another ATP-dependent interaction occurs; the enzyme phosphofructokinase converts fructose-6-phosphate to fructose-1,6-bisphosphate. This 6 carbon sugar now has 2 phosphate groups attached. This molecule then gets broken up into 2 3 carbon molecules using an aldolase enzyme. These 3 carbon molecules are glyceraldheyde-3-phosphate and dihydroxyacetone phosphate (DHAP). Only glyceraldheyde-3-phosphate can progress to the next stages of the reaction, but DHAP can be converted into glyceraldheyde-3-phosphate with the enzyme triose phosphate isomerase. Glyceraldheyde-3-phosphate is then converted to 1,3-bisphosphoglycerate using glyceraldehyde phosphate dehydrogenase, which also produces one NADH. At the end of glycolysis, there is a NET gain of two molecules of pyruvate, two molecules of ATP, and 2 molecules of NADH. If oxygen is available, the pyruvate can enter the mitochondria and be oxidised to carbon dioxide through the process of cellular respiration, releasing high energy electrons and many molecules of ATP. If oxygen is not available, anaerobic respiration occurs, producing lactic acid.